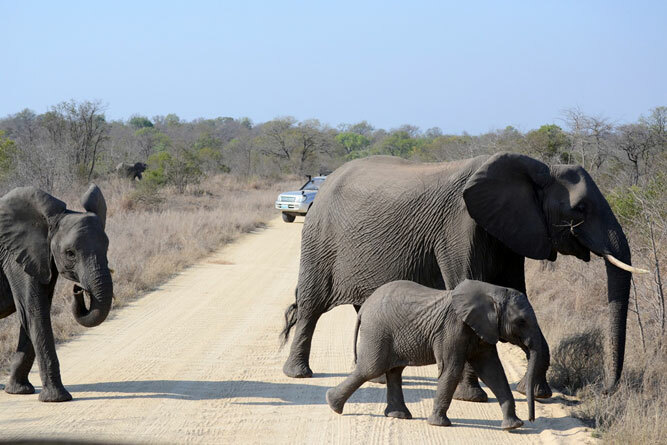 As young girl, I first visited the Kruger National Park with my parents and brother. We stayed in a camp just outside and drove in during the day seeking out animals and waiting for them to burst out from the bushes. For large chunks of the drive we didn’t see much except bush, acacia trees and large rocks forming little mountains. But each time my brother and I laid eyes on an elephant herd making its way across the road or a giraffe bending over to eat the leaves of trees, it was magical. I went out expecting absolutely nothing and that way, everything was a delight. I watched the purple blue sky transform into one filled with light. Glossy starlings perched atop trees and fluttered in and amongst the dry trees. I was still trying to wake up with aid of coffee but the creatures of the wild seemed as if they never slept. 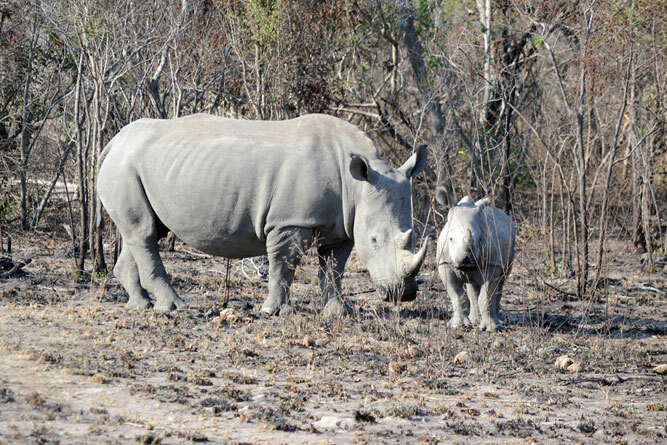 Three rhinos fed on plants in an otherwise dry riverbed. When they saw the game vehicle, one bold rhino stood right in front of us, sizing us up before stomping his foot and trotting off. Giraffe beside a young calf nibbled leaves for medium sized shrubs. The Baby with its skinny body and tall neck surveyed us quietly, totally forgetting all about his food. 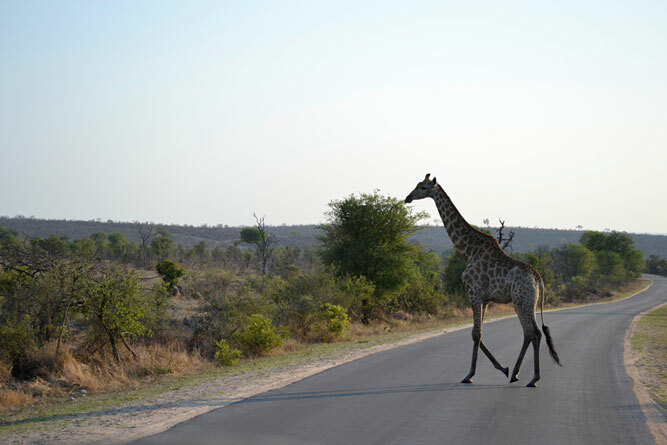 Even though it was early in the morning, the heat of the African bush was already scorching. Masses of impala continually chewed, with their mouths moving side to side. They sort shade together in groups and seemed to stand perfectly still outside of the sun’s heavy glare. As we drove slowly down the dusty orange path, we encountered a large herd of elephants making their way across the path. The babies were my absolute favourite and never moved too far away from their moms or female family members. Later on, we saw another herd. Only this time they were squirting themselves with deliciously cool water. We watched from the bridge as the babies slowly got used to utilizing the muscles in their trunks. Euphoric, they seemed to gather great joy from playing in the water. 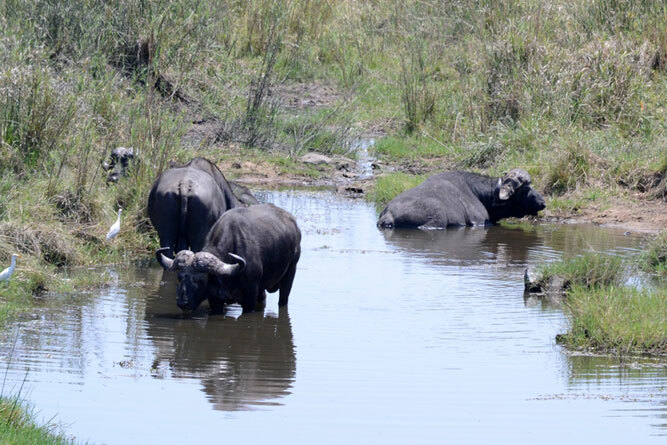 Heavy buffaloes could also be found near the water’s edge, looking for the opportunity to quench their thirst. Kingfishers flitted above four crocodiles waded in the waters of the Crocodile River as an eagle made its way directly above us. Up on the slopes, male Kudu interrupted their feeding to glance over at us – their twirling horns, one of their great weapons of defence against predators. 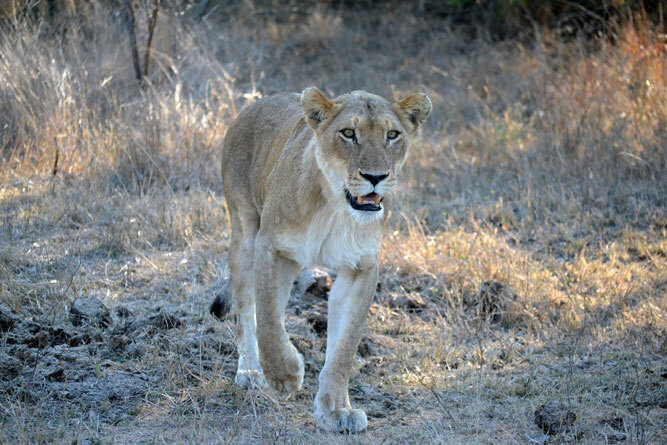 In the heat of the day, we watched two lionesses awake from their lazy slumber to watch and stalk a family of warthog. Clever as a fox, they instinctively communicated their game plan of ambush and attack to one another before going in for the kill. Patient, intelligent and graceful, they sauntered beside the acacias before splitting up on either side of the road to wait. Never giving too much of their energy until it was needed most. We were able to watch the start of the chase, but as they disappeared behind the vegetation, we wondered who would come out on top today. At dusk, we vaguely saw a pack of wild dogs attacking their territorial competition, hyenas. Two male lions, showing the scars of past fights lay on the side of the road panting and breathing deeply after a kill. A rhino and her baby lay resting in the sand but immediately sprung to their feet when we came closer.